From catering environments through to educational facilities, our Mixing Bowl is a vital resource. Manufactured from a lightweight and durable polypropylene, this large 4 litre bowl boasts a flattened base for easy use and durable stability required for vigorous mixing. Whether it's whipping up the perfect Victoria sponge or stirring up the contents of a succulent chocolate brownie, this transparent bowl allows you to easily identify the contents while a curved rim provides exceptional grip. 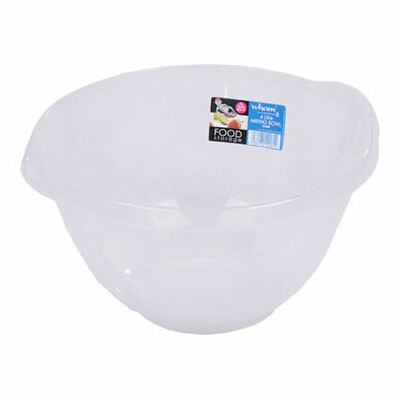 As part of our catering supplies category, this mixing bowl promises to fit in easily with your existing kitchen ware. Here at Gompels, we support the work and efforts of catering staff up and down the country. That's why items including our Black Nylon Whisk or Baking Parchment are all available online here and for an exceptional wholesale price.